As every year military, student fraternities and politicians participated. Amongst spectators were also member of the student fraternity “Danubia” that is often connected to the “Identitarian Movement” and is mentioned in the german national intelligence service’s yearly report on extremism in Germany under the category of “Other Right-wing Extremist Groups” (http://www.verfassungsschutz.bayern.de/mam/anlagen/vsb_2015_druckfassung.pdf – page 137 ff.). 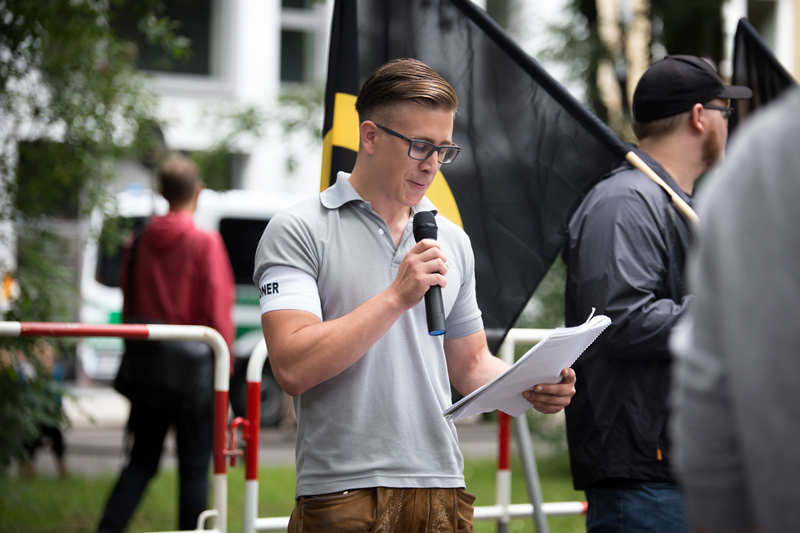 The “Identitarian Movement” held a rally on the other side of the state chancellery this summer. One person holding a speech at this rally was a member of the student fraternity “Danubia”. Around the neighbourhood of the newly achieved fraternity housing in Munich, Schwabing spraypaintings and stickers can be repetively found that show the ‘Lambda’ sign of the “Identitarian Movement”. After one hour in the cold, the meeting of military, student fraternities and spectators ended with pictures in front of the historically charged Feldherrnhalle. Military, Officials and Student Fraternities hold memorial for fallen soldiers and all people killed in front of Bavarian state chancellery.